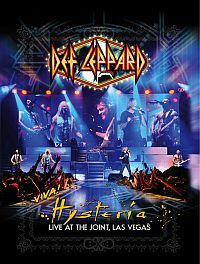 Subtitled “Live At The Joint Las Vegas” you’ve guessed it - this is a live CD/DVD combo. With twenty nine tracks there isn’t really very much missing and I have the CD rather than the DVD. Their residency saw 1987’s Hysteria played front to back with a set moving around it. Fortunately they have great sound here, much more than can be said when I saw them tour that album years ago! You know the songs, and the band don’t disappoint, singer Elliott especially crisp. But there does seem to be a certain something missing and, having both viewed and reviewed a number of DVDs filmed in the USA, I can only hope it’s the crowd. Apart from lacking the hyper production of the original albums you wouldn’t often know it was a live recording, some minimal crowd interaction aside. This is a must have for Def Lep fans and any lovers of good hard rock should grab it too. There isn’t a stand out moment, as it was clearly a solid set each night, this being recorded across multiple shows. It shows the band can still deliver live at least, the lack of material from their last couple of albums suggesting they agree their studio days may be behind them.